An elected body corporate which manages delegated powers in regards to the delivery of education services within a defined territory. A body corporate to which, in defined territories, is delegated the constitutional mandate in regards to education, and which is usually comprised of elected trustees (sometimes called members); said board, like other bodies corporate, with the power to sue and be sued and to own and manage real property. 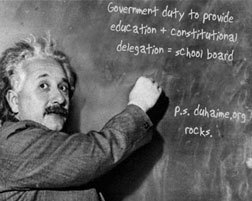 "Local boards of education are also agents of the municipality that they serve, however. This court has recognized that the state, in the exercise of its policy to maintain good public schools, has delegated important duties in that field to the towns...."
"Boards of education and school districts are governmental agencies created by the legislature and subject to its will." "Under the Canadian Constitution, the provinces have exclusive jurisdiction over education. Local school boards exercise powers delegated to them by the province. "A school board is a corporation. "A board has the powers that are either set out expressly in legislation or regulation, or that are necessarily incidental to the exercise of the legislated powers...."
Brown, Anthony, Legal Handbook for Educators, 6th Edition (Toronto: Carswell, 2009), page 74-75.